Looking to get in some practice last night, the breeze was looking great. From about 3pm right up until 6pm, when Ned and I headed out, the wind was averaging 20kts from 095 to 120 degrees. I checked the radar at about 10 minutes after 6pm and there was nothing moving towards Chicago from the North or West at that time; there were some cells out over the middle of the lake or further east so we headed out. We were sailing basically due east when about 1/2 mile off shore we saw a bolt of lightning ahead of us. I thought, hmm, that's odd, not supposed to be anything near us. So figuring that cell was moving ESE, we tacked onto port and sailed south to give it a wide birth. We were probably then about 1/2 mile out off of Diversey Harbor when the wind dropped from 12kts to 6kts and we said uh oh...this is weird. So we set the kite and started sailing back towards Belmont. About a 1/4 mile from the harbor the wind started backing to the east and building; we dropped the kite as we could no longer fetch and started two sail reaching in 15kts from about 090. The breeze kept building as we approached the harbor and a squall line moved towards us. 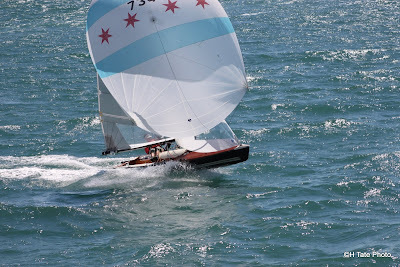 We put in the flattener and dropped the rig back past 25' 0" and started sailing towards Montrose Point hoping to just ride out the gust on a close hauled course. The breeze started clocking and continued to build, probably about 28kts so we said we need to get in. We were just North of Belmont Harbor so we tacked around and talked through our plan: we'd try a bear away and sail dead down into the harbor. The breeze was now well over 30kts as we bore away and got the boat pointed dead down. We were probably doing about 16-18kts of boatspeed in insane 5-8 foot square waves bouncing off of the seawall. I said to Ned this is no good, we're going to eat it like this; we needed to slow down as we were jumping off of the confused waves. We got the boat back up to a close reach and made the call of the day to drop the main (who lashes their sail up?). Ned got the sail down and we got sorted and headed back down under jib only. This was absolutely the look and we were able to sail at the same speed as the waves. The boat performed admirably. A bunch of Vanguard sailors went into the water. I think the most breeze we saw was just over 40kts. We were monitoring our VHF and once we had the boat on its dolly, we headed out in a RIB as there were reports of V15 sailors in the water off of Belmont. When we got out there the CPD and CFD boats were on the scene and everyone had been retrieved. The storms built between Evanston and the city and then moved SSW over Chicago. I've never seen anything like that. The peak gust while we were sailing was measured at 47kts and the storm later produced winds over 70kts. The boat is ready to rock. Many more pictures HERE. Light at the end of the launcher tube. So rigging this boat is a lot of work. Estimate how long each project will take, then multiply by 4. Check us out on Facebook for daily updates on the rigging project. Too tired at night to post here. The picture below sums up how badly I would like to finish this up. 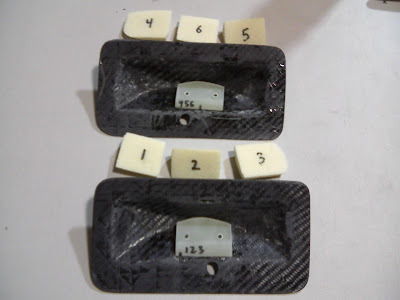 I used some tapped G10 to accept the cheek block fasteners and some foam to fill the void behind the plates. 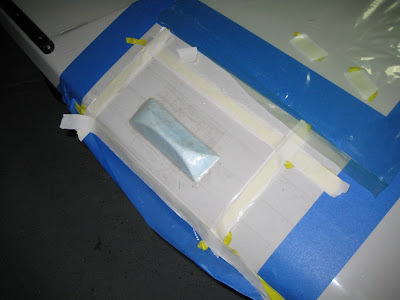 This was all bonded with a thickened epoxy mixture. 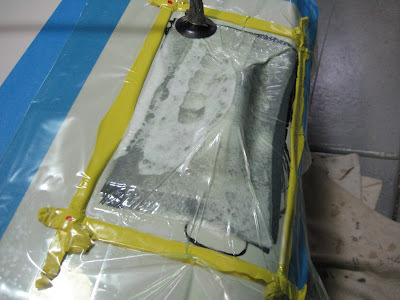 McLube on the fasteners prevents the epoxy from bonding to the stainless. Guy turning block riser plates were molded on the boat for a proper fit to the curvature of the deck. 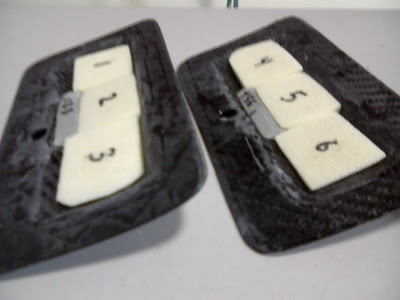 Packing tape and polystyrene foam were used to make a male mold. 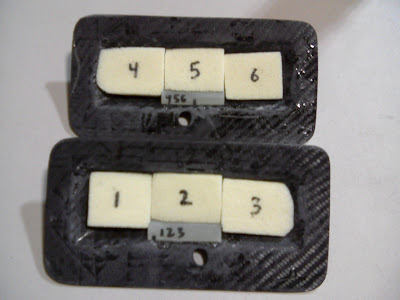 I use some McLube on the packing tape to help the part release easier. Make sure you leave the mastic covered until the wetted out cloth is on the part and you are ready to lay the bagging film down. 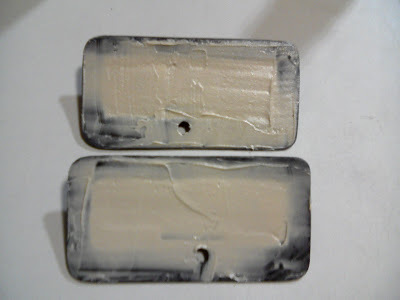 if you get epoxy on the mastic, you will not get a proper seal. Layup stacks ready to be wet-out on cardboard. I used 2 layers of 8 oz carbon twill on the top followed by 3 layers of 6 oz s glass followed by another layer of carbon twill on the bottom. Preparation is key for the vacuum bagging operation. Everything should be pre-cut and staged where it needs to be. Especially when your work partner is playing golf in California and you are working alone. 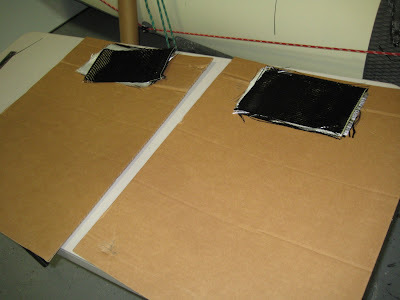 Shroud tracks were ground to fit the curvature of the deck and bedded in epoxy and filler colored wit black pigment. 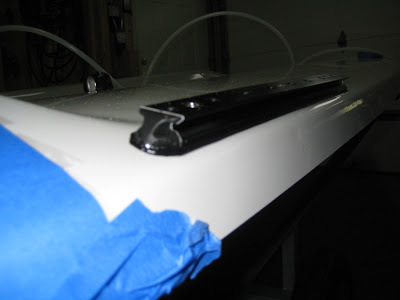 A small fillet was used on the bottom edge to finish the install. 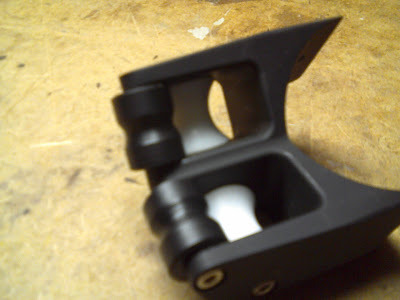 1/4" G10 plates were bonded on the side of the centerboard case to mount eyestraps for some shockcord take-ups. The plates were drilled and tapped before they were bonded in. 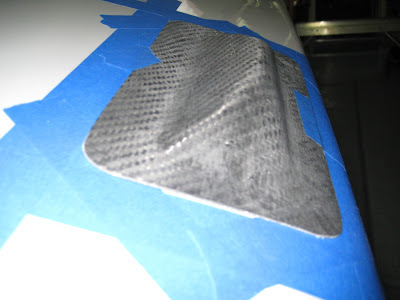 Use some sacrificial hardware coated in McLube to keep the epoxy and filler from filling the tapped holes. These plates were masked and painted with a rattle can. 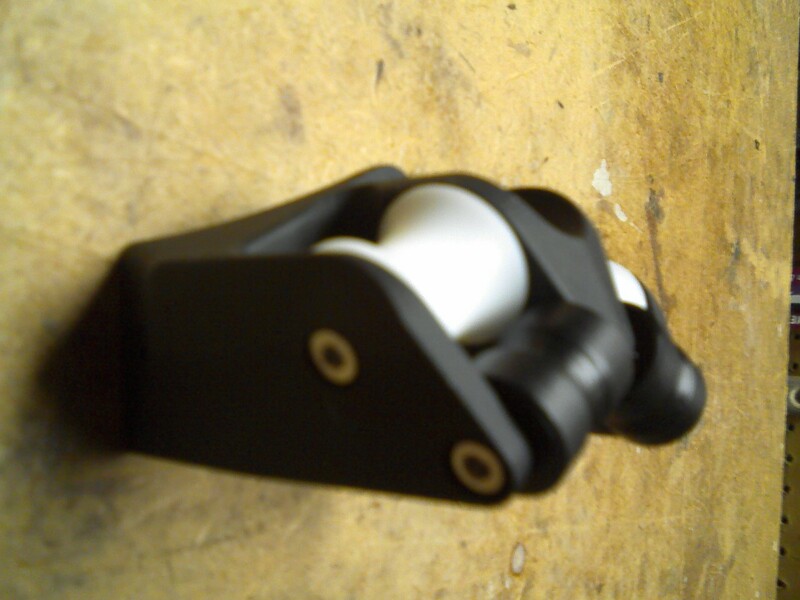 Custom quintuple block mounted on the forward bulkhead. 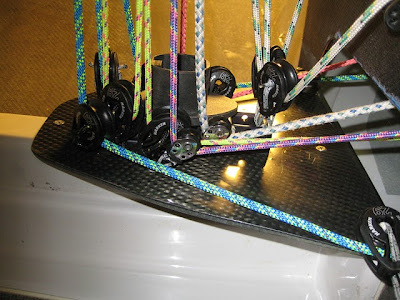 This block was made using Harken 16mm self-contained sheaves with 1/16" carbon disks between. 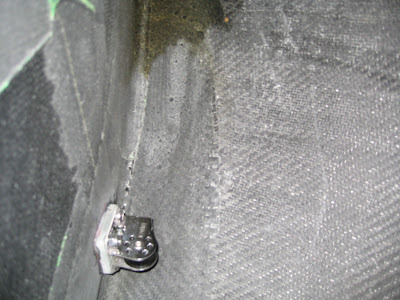 Duralac was used on all the carbon/stainless interfaces to prevent corrosion. 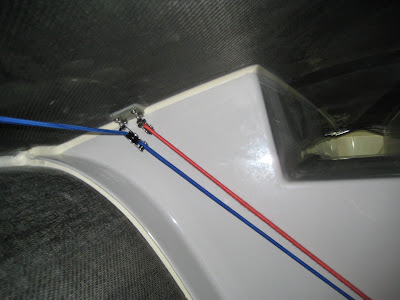 This block is to lead 5 shockcord passes under the launcher tube; 3 for the trapeze take-up and 2 for the foreguy. Another bonded G10 plate for the trapeze and foreguy shockord. Turning block for the guy control line led aft along both seat tanks. This G10 plate was bonded in with 1 of the 4 fasteners through bolted on the diagonal bulkhead. This was a tricky install due to the complex angles involved. 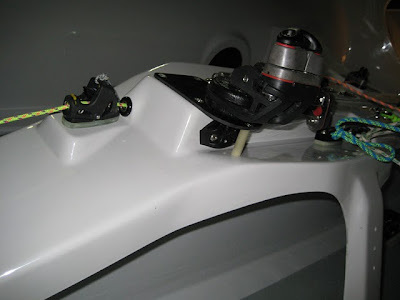 Under deck launcher cleat hardware mounted to G10 plates. Note that the deck on this boat will be super clean as none of this hardware is through bolted. 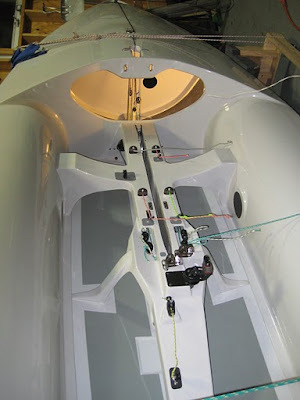 There is just a bullseye where the line exits and the Melges flanges on the aft face. Guy turning block riser plates being vacuum bagged. 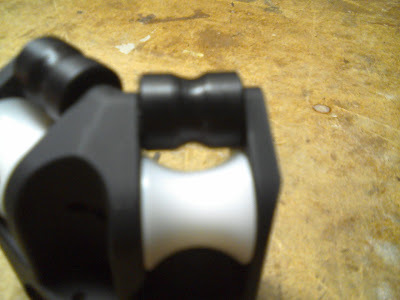 Note that the suction cup is placed outside of where the part will be taken from. Riser plate unmolded, trimmed and sanded. These turned out great and will get clear coated. More pictures in the GALLERY. At last it's spring in Chicago, though one might have been fooled by the snow falling on Monday morning. 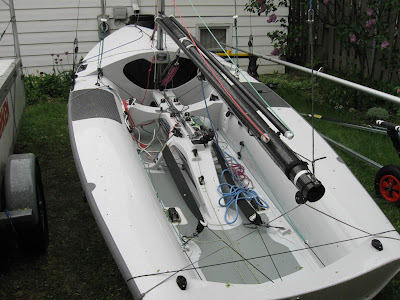 Happily, we've had enough warm weather to dive into the fitting out of my new Rondar USA 9042. 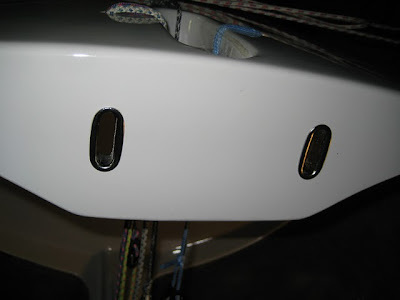 Craig and I spent a lot of time talking over the winter about the rigging philosphy of the boat and what systems we thought needed to be implemented. The boat borrows heavily from Craig's own layout on USA 7346, but has been adapted to the particulars of the Rondar. Overall, we've found the Rondar to be easy to layout as the wide centerboard cap gives you a lot of options for placing hardware. 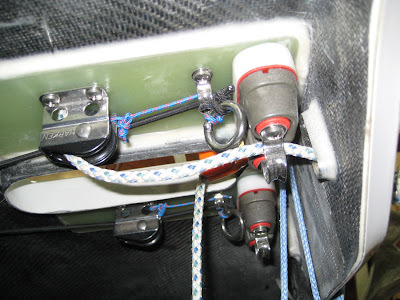 The width allows clean leads on the various purchase systems and helps keep them out of the way of the crew. Fleet 13 spent this past weekend at Carolina Yacht Club’s inaugural and hopefully annual 505 regatta in Wrightsville Beach, NC. Organizers and locals Jay and Charles Smith put on a fantastic show for the twelve teams that assembled from as far as St. Pete, FL and Boston, MA as well as our trio of Chicagoans. The balance of the fleet came from Region II. After the Midwinters in St. Pete in late February, Craig staged his vehicle with USA 7346 and the Longs’ USA 8821 in storage arranged by Jay Smith near Raleigh, NC. Matt Woodworth, who sailed with Craig in Wrightsville, drove down JB Turney’s car, trailer and USA 7611 with the help of his cousin Tyler. With Ned unable to sail this event, I called up Tripp Burd who was stoked to sail; I had to apologize for asking him to sail a “slow boat” for the weekend as his usual ride is an F18. We all arrived late Friday night and made our way to our housing to catch some rest. Saturday morning dawned with brilliant blue skies, a cool temperature and the promise of, big, big breeze as a massive front rolled through the area. With the first race at noon we had plenty of time to get the boats and ourselves prepared for the day’s racing as the westerly breeze continued to build. One thing we failed to pack was the beef as JB/Tripp (350 lbs) and Craig/Matt (345 lbs) felt a little light given a forecast of breeze in the mid 20s. Tripp and I had never sailed together before so having a first go of it in big breeze was a true baptism by fire. Thankfully, Tripp is an accomplished and experienced high performance sailor so we were both comfortable if rusty in the conditions. The Longs were unable to make it out as their top pintle was badly bent when launching; this damage ended their day. After a few spills by most of the fleet in pre-race practice, race one began with a gusty 16-23kt breeze offshore out of the west. Locals Charles and Jay Smith were the pathfinder and they opened the gate for the fleet. Bixby/Buttner lead the group left with Moore/Miller to weather on their hip. Turney/Burd bailed to the right and benefited by getting out of the foul current running from the channel mouth and by getting onto the lifted tack first. With great pace Bixby/Buttner lead from the left with Moore/Miller just ducking Turney/Burd, but then passing them on the starboard layline. 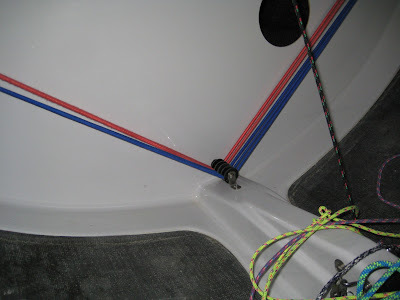 After rounding, Turney/Burd discovered that our starboard spinnaker sheet had been under the bow. This ended race one for us and sent JB up onto the bow for a session of re-rigging. The remainder of the fleet set kites in the building breeze and charged downwind with plenty of wipeouts. On the second run Moore/Miller, who had taken the lead, successfully gybed, but shortly afterwards stuffed into some chop and watched their mast fold in half ending their regatta. Bixby/Booth held on for the win followed across the line by only Amthor/Romey and Shluter/Renda; there was no one else left. Turney/Burd sailed back down to the RC boat hoping for a second race to find out that we were headed back in towards shore. 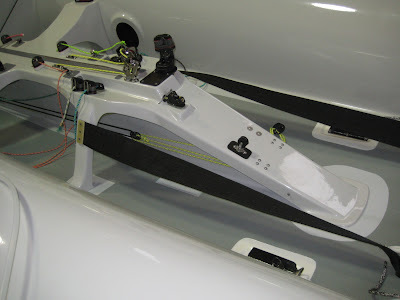 It was undoubtedly the right decision given the deteriorating conditions; the RC clocked a 37kt gust during the race. The damage count was two broken masts as Smith/Smith had sadly also sacrificed their stick on the altar of 505 sailing. Craig noted there were also many broken egos in evidence. The fleet regrouped on Saturday night for a delicious taco bar dinner and basketball watching hosted by Jay and Charles Smith’s parents. The great group of support boats captured a lot of video and some fantastic pictures of the day’s sailing. Sunday seemed like the calm after the storm with warm sunshine and a glassy sea. The fleet sat postponed ashore while the RC monitored the breeze on the ocean. Fortunately, the sea breeze began to fill in and we headed out on the water around 11am. The RC timed the breeze perfectly as teams just began stepping out onto the trapeze at the start of race two of the series. Bixby/Buttner lead out of the left with good pressure and lead around the mark trailed by Turney/Burd, Thompson/Woodworth, and Amthor/Romey. Everyone gybe set to stay in the pressure and headed downhill squared back. Keeping with our weekend theme, Turney/Burd sailed the second leg with the spin sheet again under the bow. Thankfully our teammates Thompson/Woodworth pointed this out to us near the second weather mark. After getting the kite sorted, Turney/Burd had faded to fourth and chose to wire run on starboard out to the left corner while the leaders ran towards the finish. There was just enough pressure for the move to work and Turney/Burd reclaimed second at the finish trailing Bixby/Buttner. The breeze continued to build to about 8-11kts in race three and settled into 5-10 degree oscillations with slight variations in pressure. Pathfinders Amthor/Romey marked the right side of the leading pack while Thompson/Woodworth and Turney/Burd were able to take advantage of a last left shift to lead around the mark in that order. On the run, the veterans outfoxed the leaders with Bixby/Buttner finding nice pressure after a gybe set to lead around the leeward mark and Amthor/Romey sailing underneath the Chicago boats in better pressure. Race four began with 12-14 of beautiful breeze and a lengthened course. Amthor/Romey were fast out of the gate and lead from the left ahead of Bixby/Buttner and the Chicago boys. There were few passing lanes in this breeze and the order held to the finish. The last race of the series began in a fresh breeze of 15-18kts. Pathfinders Turney/Burd opened the gate and initially held decent pace with Bixby/Buttner and Thompson/Woodworth to leeward and ahead. Bixby/Buttner showed superior speed to lead around the weather mark trailed by Craig/Matt and JB/Tripp. We all enjoyed the great sailing conditions, but no one was able to find enough leverage to make a pass and the order held to the finish. Congratulations to Ethan and Drew for a solid win! Thanks are of course due to organizer Jay Smith for the fantastic job he did putting this event together. Carolina Yacht Club put on a great event and the RC did an admirable job with tough conditions. Our PRO for the event was actually a Chicagoan, Vicki Mathews who helped us out at the 2010 North Americans. It was great to have Vicki working with the 505s again. Fleet 13 would also like to thank the Stones for housing us and for showing us such great hospitality. We cannot wait to come back for a future event here. Barberhaulers – a must on Saturday. This is an adjustment that I don’t yet have figured out. Sometimes I feel like we’re reaching off the course and sometimes we feel too “bound up” – more practice needed testing settings on this. Vang – I was simply sailing with too much on Sunday and I think this is why our speed felt so poor. Thankfully Tripp observed this and helped me get the boat moving. It was a long drive back to Chicago on Sunday and Monday, but it was well worth it! To build JB's double trailer, I modeled the entire thing in 3D using Solidworks. Evan Thompson made a model of the 505 hull from the line drawings on the class website. Contact me by email if you would like the Solidworks files or the trailer construction drawings (PDF). The new double trailer has been finished and is ready to roll to Wrightsville Beach, NC this weekend. I'm pretty stoked about this unit and I have to again thank Craig and Evan Thompson for all of their contributions to and help with the project. Also, thanks to Sno Bird Trailers for delivering an excellent product. It has been a busy month, sorry for the lack of new postings. We will have a lot of good content coming up this month and next as we resume our work on rigging JB's boat. JB also just took delivery of his new double trailer. More info and pictures to follow. I did a parking lot modification at the midwinters this year in an attempt to get the pole to release off the mast fitting more reliably. 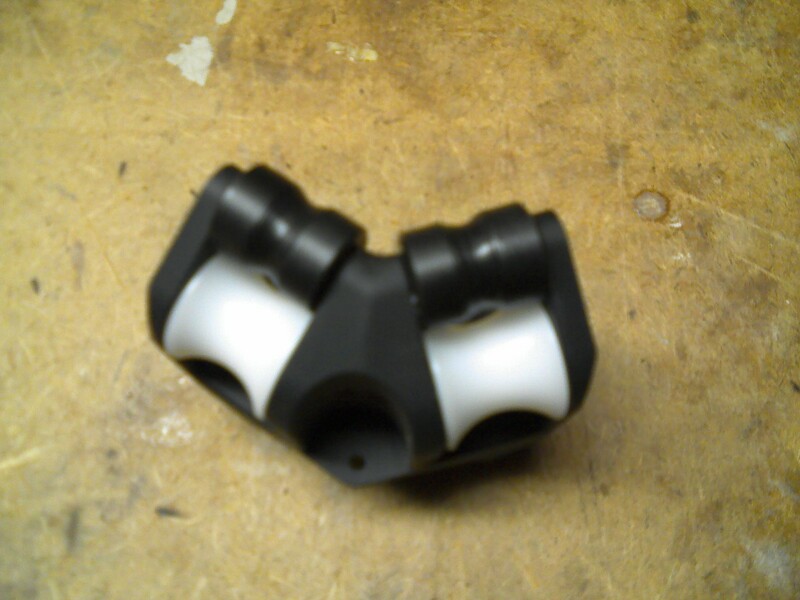 The experiment was successful and I have now made some larger bushings to replace the stock stainless ones. 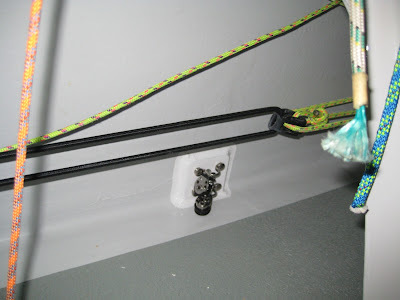 The idea is that you don't want the pole to seat as deep onto the fitting. The Hot Setup. Midwinters tomorrow. New venue for the midwinters is sick. Everyone who couldn't make it, I'm sorry. When you have the hot setup, you know you have a program going. Poles flying off the mast now. 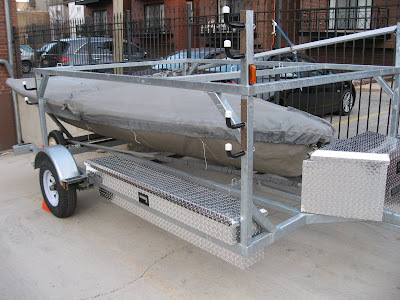 Since I've added a second boat for this year, I decided that it would probably be a good thing to have a trailer with which I could move my boats. Because any existing trailer would have to come from a few thousand miles away and the fact that Fleet 13 has never been impressed with any of the production doubles, we decided to go with a custom rig. Craig and Evan Thompson have been instrumental in getting the details of the design sorted out and I am very thankful for their help. We've been working with Snobird Trailers in Slinger, WI. These guys have been incredibly helpful and based on my visit yesterday look to have executed the build to a high standard. 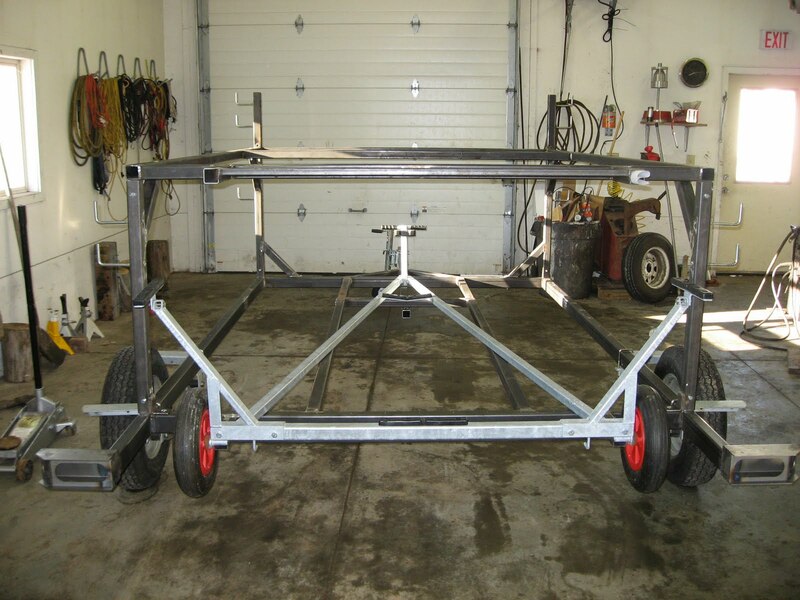 The trailer has yet to be galvanized, but once that is done we'll be adding a pair of Tradesman side mount boxes on the length-wise members and a tongue box on the forward triangle. We'll also be adding some 1/2" Delrin plastic on the cross bars to allow the dollies to easily slide onto the trailer. Snobird is also going to weld on some pieces of angle to limit the side-to-side movement of the dollies as well as some pad-eyes for ratchet straps. 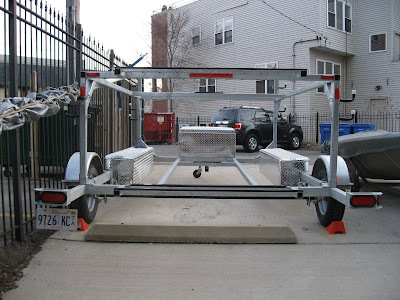 This trailer is very heavy duty and we're quite pleased with that. It can also accommodate any type of dolly, providing welcome flexibility. We'll be posting details of the finished product next month. Want a ride on a 505? -Do you live in Chicago? -Does 505 sailing look like a blast? -Can you sail a Laser or V15? If you answered yes to all of the above questions, please contact Fleet 13 Captain JB or webmaster Craig and we will take you for a ride.